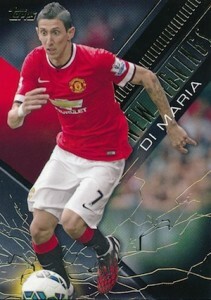 Following up on their 2013-14 release, 2014 Topps Premier Gold Soccer returns for the 2014-15 Barclays Premier League season. The hit-centered product promises ten total hits, including one autograph or memorabilia card per pack. The base set checks in at 150 cards and marks a decrease from the previous edition, which included 200 base cards. Green, Purple (#'d), Black (#'d), Orange (#/11) and Premier Gold (1/1) parallels add color and rarity. The base set also includes Printing Plates (1/1). 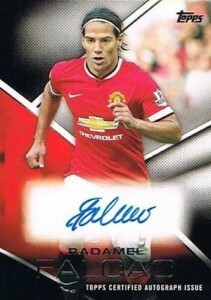 Autographs look to be the main focus of the premium soccer product with five per master box. Premier Autographs include 31 subjects and feature Green, Purple (#'d), Black (#'d), Orange (#/11), and Premier Gold (1/1) parallels, as well as Printing Plates (1/1). Premier Jumbo Autograph Relics combine a signature with a large jersey piece. Each card is numbered and parallels include Black (#'d), Orange (#/11), Premier Gold (1/1) and Printing Plates (1/1). A new addition, Crowning Achievement Die-Cut Autographs are a guaranteed case hit. These numbered die-cut autographs are also available as Orange (#/11) and Premier Gold (1/1) parallels. Memorabilia cards continue their prominent role with five cards per master box. Football Fibers Relics feature up to 40 subjects and multiple parallels, including Green, Purple Jumbo (#'d), Black Jumbo (#'d), Orange Jumbo (#/11), Premier Gold Jumbo (1/1) and Printing Plates Jumbo (1/1). 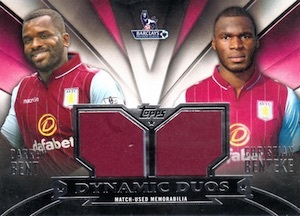 Dynamic Duo Relics pairs two players on a serial numbered card. Limited Black (#'d), Orange (#/11) Premier Gold (1/1) and Printing Plates (1/1) parallels are also available. Lastly, a total of 50 insert cards complete the product. 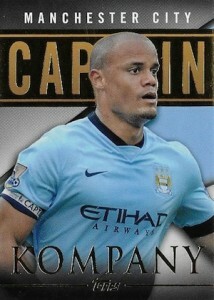 Captains inserts feature 20 top captains from the league. New Signings inserts highlight off-season transfers and Future Stars showcases 20 up-and-coming players. All inserts include Green, Purple (#'d), Black (#'d), Orange (#/11), and Premier Gold (1/1) parallels, as well as Printing Plates (1/1). Serial Numbered #/50. Case hit. 9 cards. Serial Numbered #/50. Good: Ten hits, better quality stock than last year, good variety of cards in box. Bad: Underwhelming base relics, weak autograph checklist, still doesn’t meet expectations of a $200+ box. 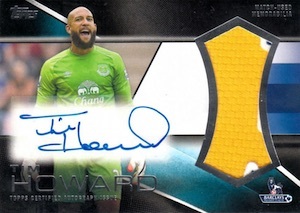 The Bottom Line: 2013-14 Topps Premier Gold made waves last year because it was one of the first major soccer releases to heavily feature autographs and also contained some big names. The sophomore effort did show some growth in design and card quality, but the pricing seems even more out of whack this year given the watered-down autograph checklist. 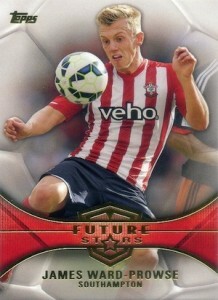 The cards in the debut release of Topps Premier Gold looked like low-end retail product, not a premium soccer offering. I appreciate the fact that Topps made an effort to work on that in 2014. The stock is noticeably better and the inserts show that a legitimate effort was made to give them their own distinct look. However, the 2014 base design did not work for me. The silver foil nameplate displayed the player’s name vertically, which makes it hard to read. The player's first name is also omitted. Even more odd, the player image is allowed to cover part of the name, making it even more difficult to see the name. Topps has plenty of brands with a distinct and quality base set. 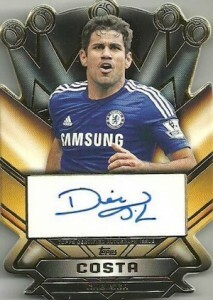 I am sure they could come up with something nice for the Topps Premier Gold brand too. Numbered parallels add some color to the majority of the base design, but they are not as strong as last year. The parallels in 2013-14 were some of the better cards in the product and it would have been nice if the parallels were foil-covered or Refractors this year. Actually, Topps should have thought hard about making this a Chrome product, maybe even with gold as the primary color, but that is a conversation for another day. While none of the inserts were amazing, they all feature a different look and were easy to spot. Since that they were hard to differentiate from the base set last year, this is a nice update and gives the box a more well-rounded feel. The inserts all utilize gold foil, which works well given the product name. New Signings have the most dynamic look thanks to the gold zigzags. Back again with stickers, the main autographs have a similar look to the base cards except with a little more color. One difference is that the full player name is on display on the bottom of the cards, which is much easier to read. The base relics are largely forgettable. Five small, one-color jersey pieces are hardly satisfying as half the hits in a box. 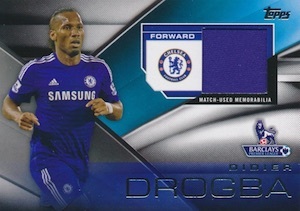 Fans of the Premier League will see some solid names in the autograph checklist, including Didier Drogba, Frank Lampard, Radamel Falcao, Diego Costa, Mesut Ozil, Olivier Giroud and Tim Howard. Curiously, I have yet to see a base autograph for Lampard. What they won’t see, however, is superstar autograph options. While Pele and Cristiano Ronaldo made for high-end possibilities last year, there is nothing on that level in 2014. The biggest autograph subject is Dennis Bergkamp, who is only part of the Crowning Achievement Die-Cut Autograph set. These limited autographs are a case hit and Bergkamp is only available as a redemption. In the hobby today, value boils down to the hits. Single-color jersey relics go for a few dollars, at best, so the autographs carry the value burden. Given the checklist issues, it should be no surprise that 2014 Topps Premier Gold comes up short in the value department. Most of the top autographs go for under $50 and and many of the others can be had for less than $10. There are some big hits, but these are the low-numbered parallels for the top names and the Bergkamp redemptions. I have been looking forward to this release all year. As a Premier League fan in the United States, it is the only readily accessible option I can collect and I hope Topps continues the brand. This made the break very fun for me, but did not blind me from the flaws of the product. Stickers are not what collectors want in any product, let alone a high-end release. I get that the logistics of a league based in England makes things more difficult, but they either need to get on-card autographs or revamp the product to a much cheaper price point. Given the global popularity of soccer, a few tweaks could make this one of the biggest products of the year, but that would have to include on-card autographs, a better autograph checklist and a more high-end design. I prefer the design to last collection, but the autograph list is no where near as strong. There are a lot less parallels this time round as all the double/triple/quad relic cards have been left out. It will be interesting to see if the return from box breaking will be at the same level as last year. There also seems to be a Dennis Bergkamp Crowning Achievements card via Redemption. problem is the crowning achievement autos are the same autos as the set. Whats the point except that its a different card? Really poor showing by topps especially after Panini put out a monster product that was WC Prizm. I mean first of all they should have made this chrome. That is the easiest decision. 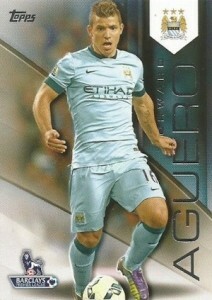 2014 TOPPS BARCLAYS PREMIER GOLD SOCCER HOBBY BOX 5 AUTOGRAPHS & 5 MEMORABILIA! !